The moment you drive through the impressive entrance gates you will feel immediately cocooned in the privacy of this wonderful estate. The castle looks majestic in this vibrant setting and the gardens are alive with colour and variety no matter the season. There is nothing in front of the castle other than green fields so you have uninterrupted views to the river beyond. The Castle itself manages to be both warm and welcoming despite its age, history and the myriad of artifacts and antiques throughout. There are cosy corners everywhere, yet there are plenty of places for the whole group to gather at times. 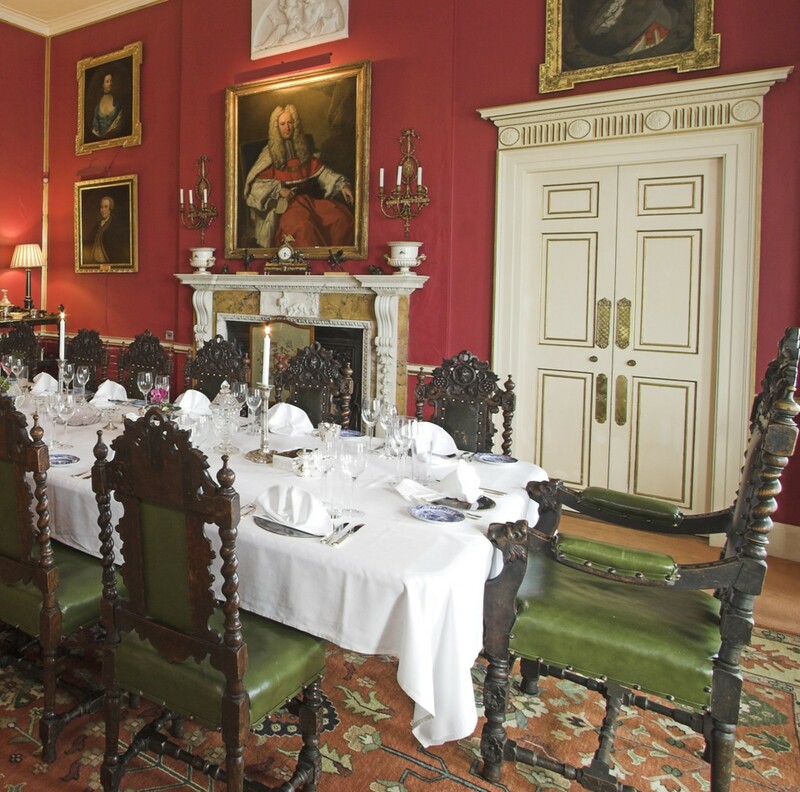 The dining room can seat everyone at once and is the ideal place for a formal meal. There are a couple of sitting rooms each with its own individual charm. The bedrooms are laid out both in the main house and in the garden wing and each has a very indivual style and layout. All bedrooms offer wonderful views either towards the river or over the spectacular gardens below. You can decide the level of service you require during your stay. 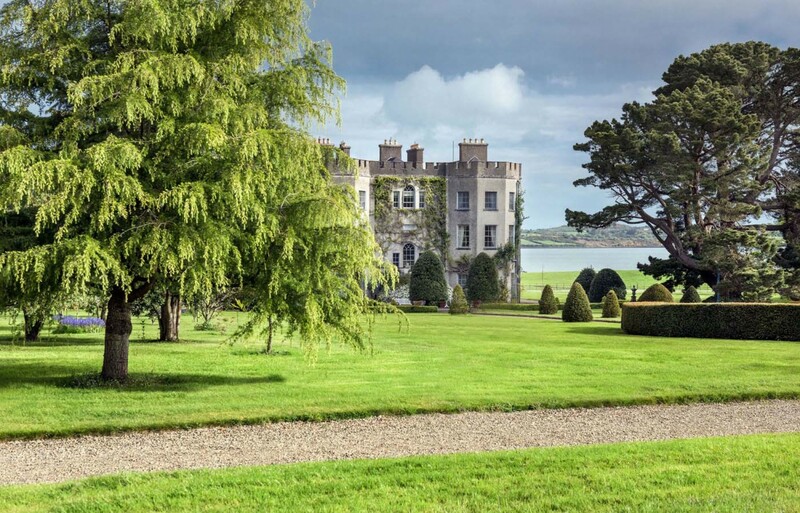 Should you wish to be left to your own devices, then you can rent Glin Castle on a self-catering basis. However, should you wish for a higher level of service, then pretty much anything and everything can be arranged from providing meals and afternoon teas to organising after dinner entertainment and daily excursions. Nothing would be too much trouble! Rates quoted are for exclusive rental of all 15 en suite bedrooms to accommodate a maximum of 30 guests with light breakfast included each morning and daily house-keeping. 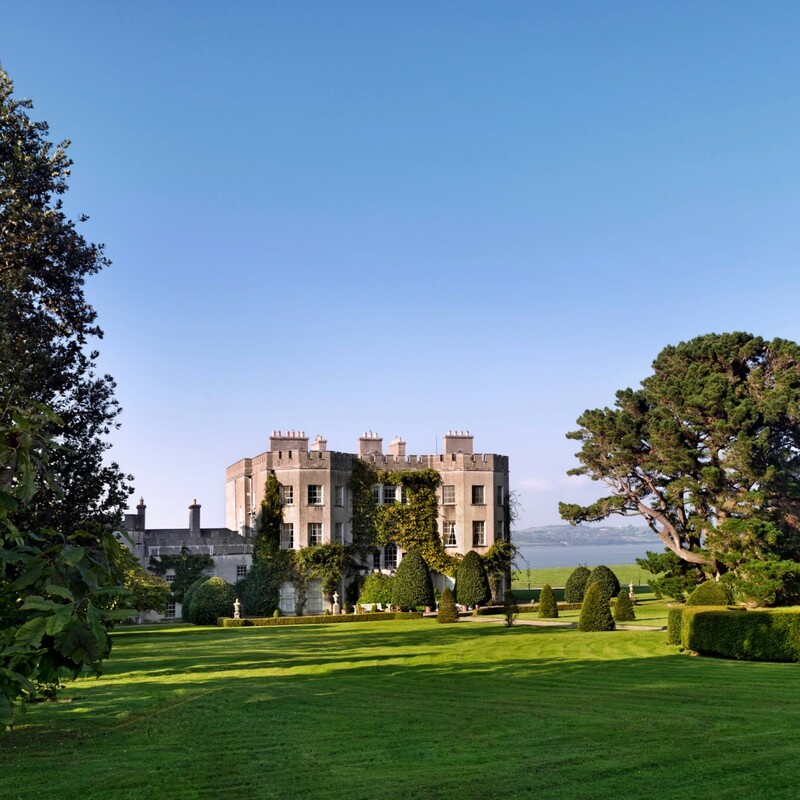 Glin Castle, home for 800 years of the FitzGerald family, hereditary Knights of Glin, stands proudly in the middle of its 400 acre wooded demesne on the banks of the Shannon. The toy-fortress like quality is echoed by three sets of battlemented Gothic folly lodges. 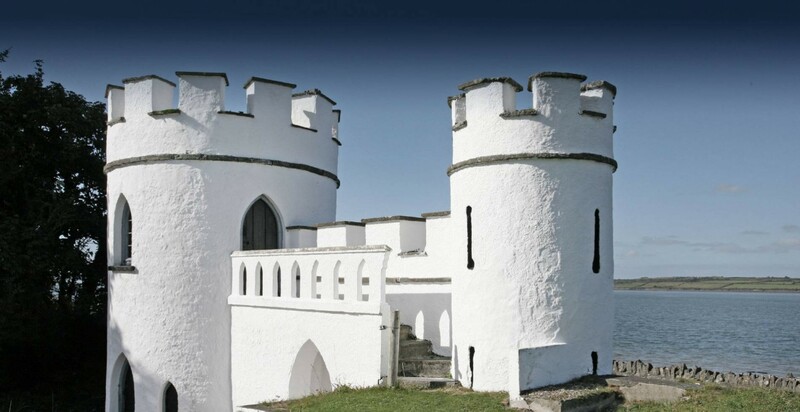 The present Glin Castle which succeeds the medieval ruin in the village of Glin was built in the late 18th century with entertaining in mind. The entrance hall with a screen of Corinthian pillars has a superb Neo-classical plaster ceiling and the enfilade of reception rooms are filled with a unique collection of Irish 18th century mahogany furniture. Family portraits and Irish pictures line the walls, and the library bookcase has a secret door leading to the hall and the very rare flying staircase. After a stroll in the wonderful pleasure grounds, the Sitting room with a crackling wood fire makes an ideal cosy gathering place for drinks before dinner. The dining room windows catch the setting sun reflected in the river in the evenings. 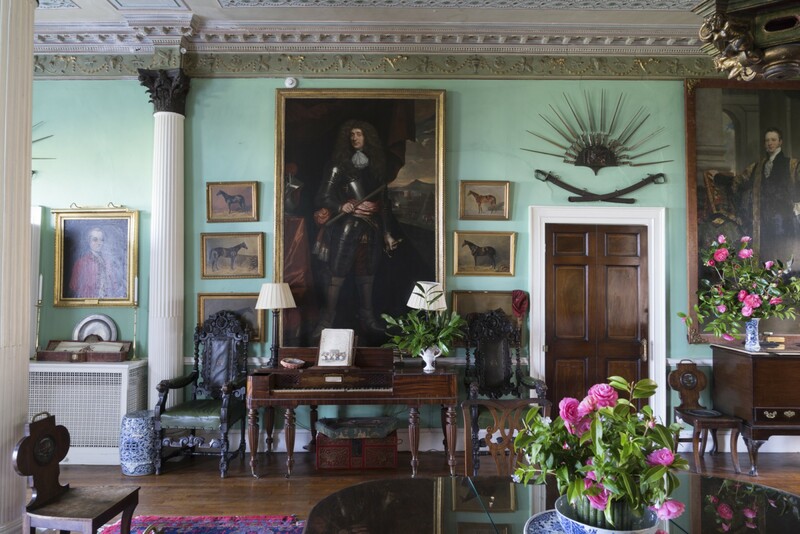 The room is filled with baronial oak furniture and a gallery of former Knights including a number of notable eccentrics such as ‘the Knight of the Women’ and the ‘Big Knight’. 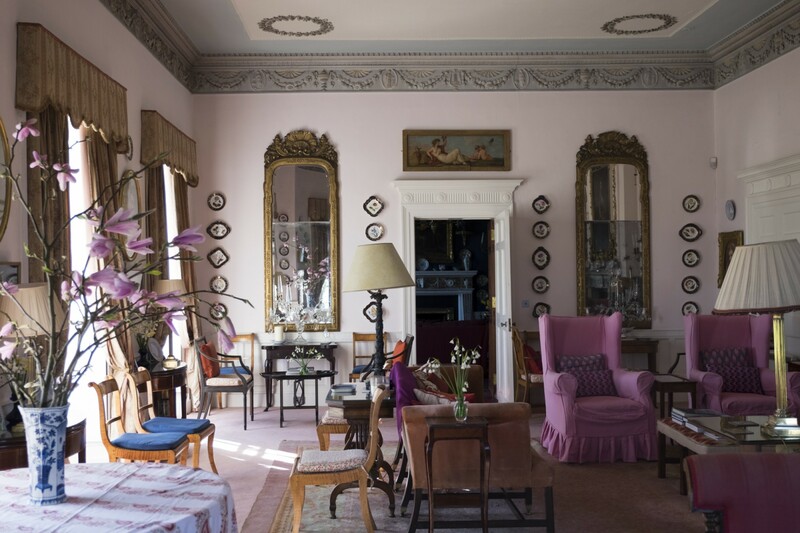 Across the hall, the Drawing room has an Adam period ceiling, a beautiful Bossi marble chimneypiece with open fire and six long windows which overlook the croquet lawn - the perfect setting for after dinner coffee and conversation. Upstairs there are 15 ensuite bedrooms. 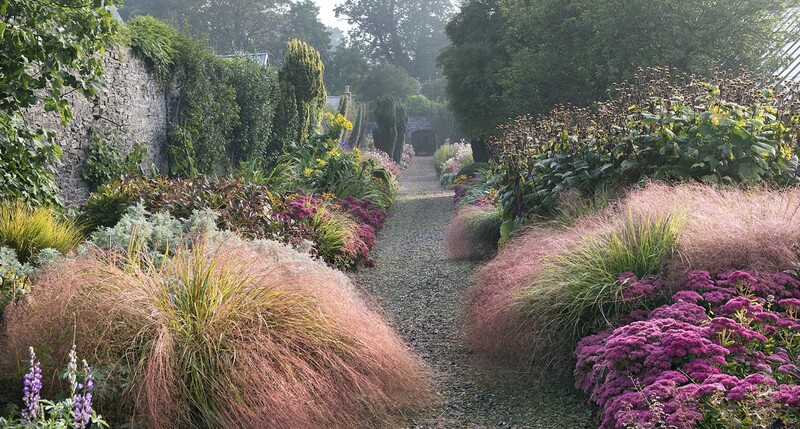 Colourful rugs and chaise longues stand at the end of comforting plump beds. Pictures and blue and white porcelain adorn the walls. The bedrooms at the back of the castle overlook the garden, while those at the front have a view of the river. There are two kitchens: a commercial kitchen which can cater for up to eighty people; and a family kitchen with Aga and Irish country furniture. 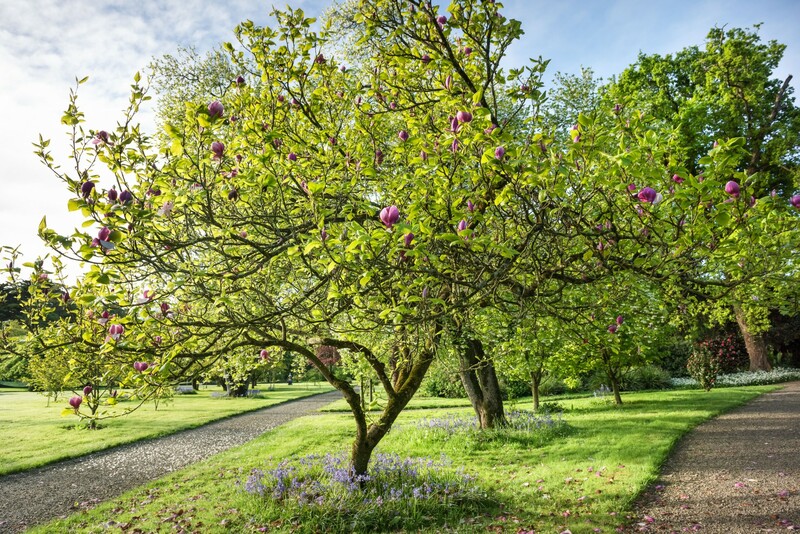 There are extensive gardens with 15 acres of pleasure grounds surrounded by formal lawns, a picturesque stream, meadow, winding gravel walks and ancient oak trees. 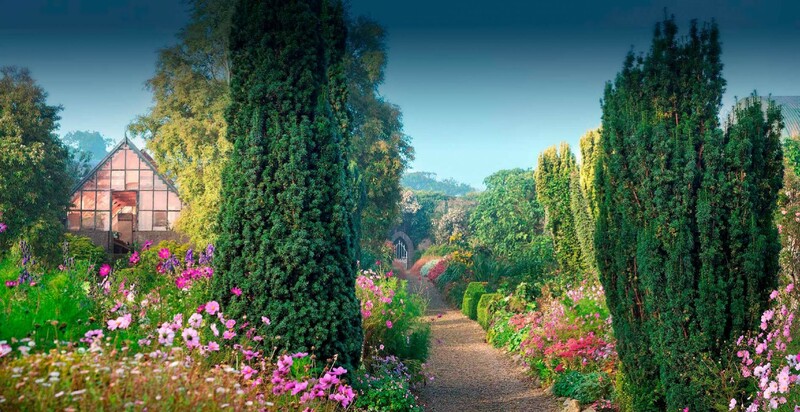 The walled kitchen garden is full of charm, with romantic borders, rose arches and a vegetable and herb plot. Adjoining it is the original stone and cobbled stable yard. The castle also has its own tennis court, hot tub and croquet lawn. There is a strenuous 5 Kilometre walk known as ‘The Knight’s Walk’, which begins at the entrance to the drive, and runs up the hill to a platform where on a clear day the view stretches down to the mouth of the Shannon and back towards Limerick. Glin Castle is an ideal base from which to explore some of Ireland’s most beautiful sights such as the breathtaking Cliffs of Moher (an hour’s distance), the Dingle Peninsula (an hour and a half drive), the 15th century Bunratty Castle & Folk Park (45 minutes drive), Killarney town and the Ring of Kerry (an hour and fifteen minutes drive) and Adare Village heritage town named Ireland’s prettiest village (35 minutes drive). Local amenities include several golf courses within an hours drive: Adare Golf course is 35 minutes, Ballybunion approx. half an hour, Tralee Golf course an hour, Doonbeg approx. an hour. The ferry across the Shannon into Clare leaves every half an hour and takes 20 minutes. This opens up the Wild Atlantic Way to the north and the UNESCO 'World Heritage' landscape of the Burren. To the south lies Listowel, Tralee, Dingle and Killarney and the southern arm of the Wild Atlantic Way. Bespoke day trip sample itineraries with suggested activities/evening entertainments at the castle can be put together for guests on request. 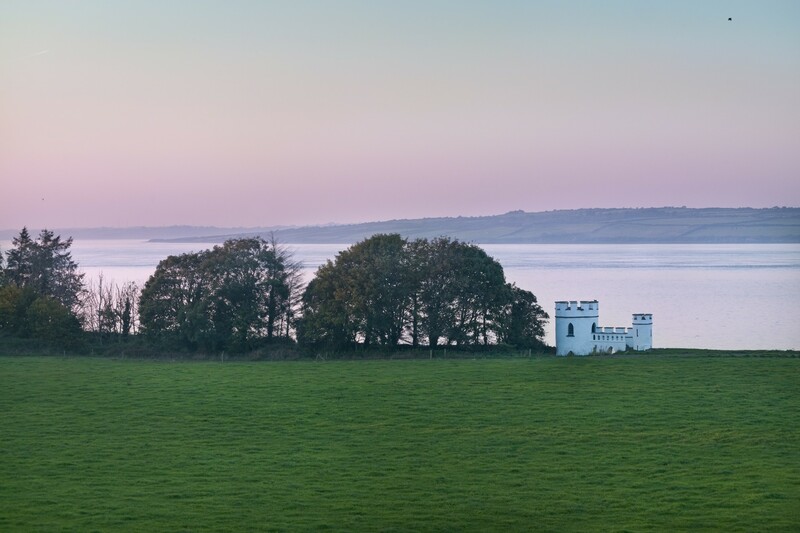 Glin Castle is situated on the banks of the River Shannon in Glin, Co. Limerick - the gateway to Southwest Ireland and the Wild Atlantic Way. Shannon International Airport is just a 55-minute drive away, Cork Airport a 90-minute drive and Dublin Airport 2 hours and 30 minutes from us. 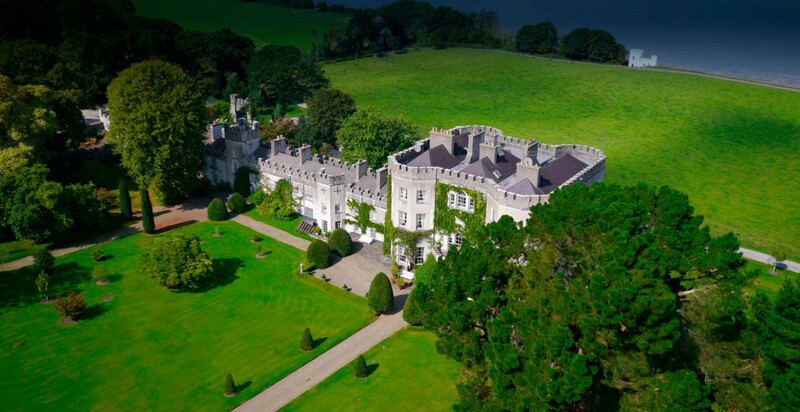 And with connecting flights to most major European and US cities from all three airports, Glin Castle is easily accessible to all.